At Home with Amy Sedaris will be back for the new year. TruTV just announced the TV show’s second season will premiere in February. The comedy series showcases Sedaris and her unique talent for crafts and homemaking. Guest stars have included Rachel Dratch, Nick Kroll, Jane Krakowski, and Sasheer Zamata. Season two of At Home with Amy Sedaris premieres on truTV on February 19th at 10 p.m. ET/PT. truTV invites guests back into the rich, imaginative – and slightly deranged – world of At Home with Amy Sedaris when the Emmy(R)-nominated series returns for its second season Tuesday, February 19, 2019 at 10pm ET/PT. Created by Amy Sedaris and Paul Dinello (Strangers with Candy), the 10-episode season of this one-of-a-kind comedy will again feature Sedaris’ signature brand of silliness as she showcases her decorating, cooking and crafting skills. This season, Sedaris welcomes an impressive list of guest stars, including: Rose Byrne, Matthew Broderick, Justin Theroux, Susan Sarandon, Gillian Jacobs, Juliette Lewis, Ellie Kemper, Fred Armisen, Michael Shannon, Ann Dowd, Martha Plimpton, Jessica Walter, Campbell Scott, Billy Crudup, Bridget Everett, Julie Klausner, Paul W. Downs, Janeane Garofalo, Richard Kind, Thomas Lennon, David Krumholtz, Ana Gasteyer, Darrell Hammond, Jackie Hoffman, John Early, James Monroe Iglehart, Matt Malloy, and more. 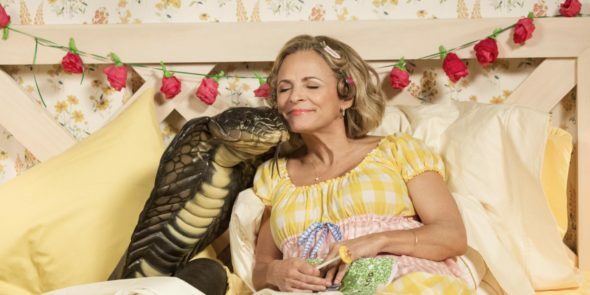 Each week of At Home with Amy Sedaris revolves around a conventional homemaking theme, with subversive twists taking segments in delightfully wacky directions. New topics explored this season include how to entertain teenagers, game nights, caring for the ill and makeovers. Hailed as “a disturbing and delicious beast” (The New York Times), “life-affirming” (The A.V. Club) and “bonkers DIY” (Variety), the series emerged as a critical hit in its debut season, garnering massive social engagement and earning an Emmy nomination in the Variety Sketch category, as well as a recent WGA Award nomination in the Comedy/Variety Sketch Series category. Building on her diverse collection of eccentric original characters, Sedaris again takes turns in a variety of roles, including Southern socialite Patty Hogg, peculiar neighbor Nutmeg, and regional wine lady, Ronnie Vino. Beloved recurring guest stars Cole Escola (Chassie Tucker), David Pasquesi (Tony the Knife Man), Heather Lawless (Ruth, The Lady Who Lives in the Woods) and Ana Fabrega (Esther) also return to reprise their memorable roles. What do you think? Have you seen At Home with Amy Sedaris? Will you watch season two? I will watch ANYTHING with Amy Sedaris! I bought Strangers With Candy on DVD and both her books. Her brother, David is hilarious also. I just love her humor. I also watched SCTV which dates me, but this is what keeps you young!